They concur on the disease but find themselves divided on the cure. 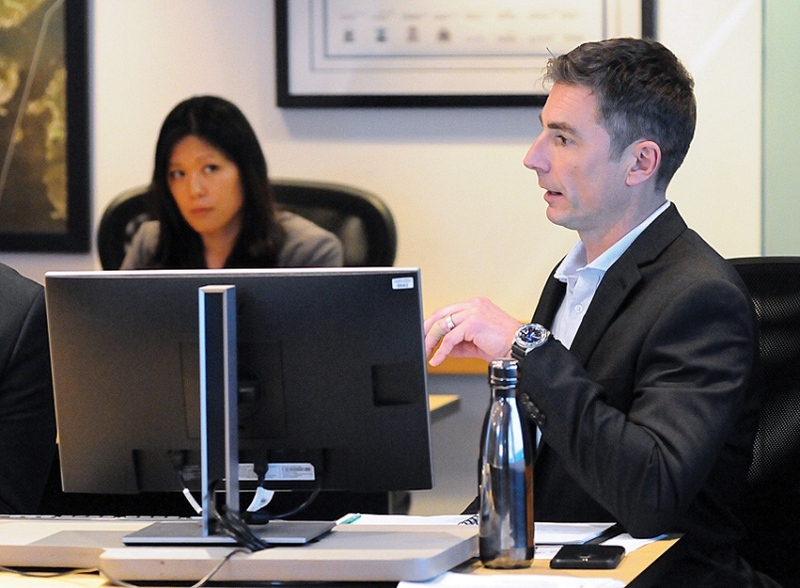 District of North Vancouver mayor and council, three MLAs, and an SFU traffic expert traded ideas on how best to alleviate the North Shore’s chronic gridlock at an informal workshop Monday evening. There is a “very direct relationship” between transportation and housing, according to North Vancouver-Lonsdale MLA Bowinn Ma, who reminded council that added roadways induce extra demand. “If we focus only on recommendations that look as though they are directly related to transportation but we don’t simultaneously tackle the challenge of housing affordability – particularly housing that is required by our workforce here – you’ll find that no matter how much money you put into your transportation system, you’ll always end up where we are now,” she said. Housing is only part of the issue, responded Mayor Mike Little. “Even on Saturdays and Sundays, when it isn’t the workforce coming here, it’s the region coming here to play. So unless the goal is also to house the people who want to come and hike in the forest, it’s only part of the piece,” he said. “[It’s] shocking to me that we are still having that conversation,” she said, vowing to challenge the notion that building more housing would reduce commuter traffic. Muri cited the constant development and dearth of affordability in Vancouver to buttress her argument. Between 2013 and 2018, the population of the three North Shore municipalities increased by approximately 4.7 per cent. During that same period, traffic on the Second Narrows has increased by approximately nine per cent to an average of 132,000 vehicles per day. Trips over the Lions Gate Bridge also increased slightly from 2013 to 2018, now exceeding 63,000 trips per day. Local traffic comprises about 25 per cent of traffic on the Upper Levels Highway, leading the region. While there isn’t “one silver bullet,” the district should concentrate on transit priority measures on the Cut combined with express bus service on the Second Narrows, according to the municipality’s section manager of transportation Steve Carney. “The billion-dollar question, or the several-billion-dollar question is: how are we going to pay for all of this?” Muri asked. Paying for major transit improvements becomes more challenging with each dollar allocated toward the proposed Broadway subway from Arbutus to UBC, according to Little. Putting the transit line underground will mean adding billions to the project’s price tag without taking a “single person” from their car, he said. But while that money is desperately needed on the North Shore, Little suggested Vancouver, Surrey, Langley, Delta and Tsawwassen are monopolizing TransLink funding. “You have a quid pro quo of five people that have enough power in the weighted votes at TransLink to change the direction of transit spending in our community,” Little said. Connecting the North Shore to the SkyTrain across the Ironworkers would be a far more prudent use of TransLink dollars than the Broadway subway, according to SFU transportation instructor Stephan Nieweler. Nieweler’s position was echoed by North Vancouver-Seymour MLA Jane Thornthwaite. Council also needs to focus on reducing the need for car travel within the municipality, according to Coun. Mathew Bond. Many neighbourhoods are transit deserts, Bond said. “They’re food deserts, they’re job deserts, they’re entertainment deserts,” he continued. The district needs to accommodate more service in a limited amount of space, he said. Moving forward, the district is considering an east-west Barrow Street-Spicer Road connector spanning the Seymour River. Replacing the CN Rail bridge, expanding ferry service along the North Shore and establishing commuter rail service from Whistler is also under consideration.